I’m glad to see that the Progressive Policy Institute’s extensive research and policy program on the data-driven economy is getting some attention in the White House. stateside investment than the top five oil/gas companies, and nearly four times more than the big three auto companies combined. These devices have done more than connect Americans to one another more easily. The integration of mobile broadband, advanced operating systems and increasingly sophisticated hardware, along with low barriers to entry to an open network, have enabled an entire economy of mobile applications to develop in the United States. This “App Economy” is one of America’s most dynamic and growing sectors, and one that industry studies have cited as creating more than 500,000 U.S. jobs since 2007. We have a lot more in the pipeline! Nationwide, business investment in equipment and software—a measure of economic vitality in the corporate sector—stalled in the third quarter for the first time since early 2009. The chart is based on BEA data. 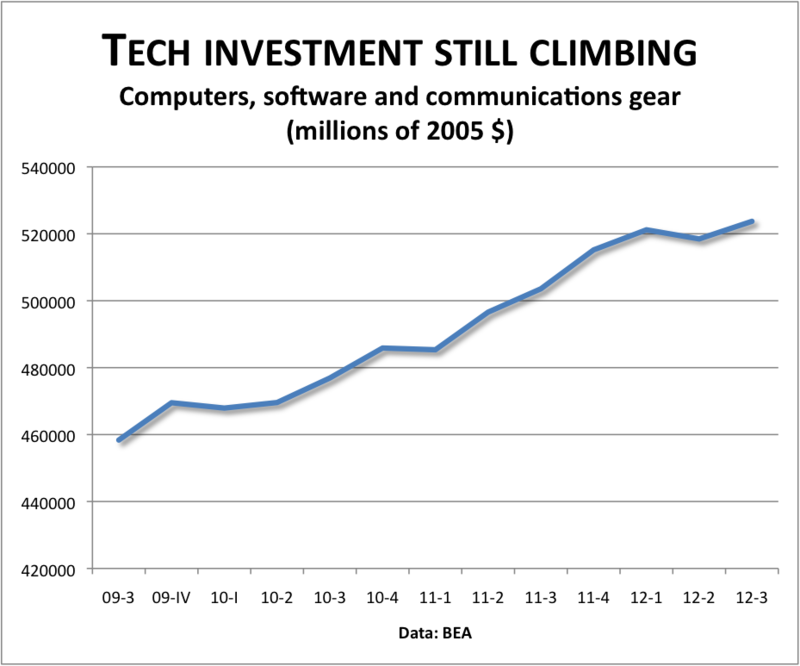 Please note that there was a pause in tech investment, but it came in the second quarter, not the third. The way to interpret this chart is that we are in the middle of a data-driven boom. Companies view investment in data and data-related equipment as absolutely essential, and continue to spend, fiscal cliff or no. It’s difficult to reconcile the sharp drop in the unemployment rate with the relatively slow growth in measured real GDP. Some have criticized the unemployment statistics, worrying about an Obama ‘conspiracy’ to cook the unemployment books. But an alternative explanation is that the government is underestimating the growth rate of real GDP by undercounting the strength of consumer data consumption. A new paper from PPI, Beyond Goods and Services: The (Unmeasured) Rise of the Data-Driven Economy, makes the case that consumer consumption of Internet-related activities–email, video, social media, games, maps, and so forth–is rising much faster than the BEA numbers show. Once we correctly adjust for consumer data consumption, real GDP growth goes up about 0.6 percentage points. So if the official GDP growth for the 3rd quarter is 2%, then the actual growth growth, adjusted for consumer data consumption, may be closer to 2.5%. That may help explain the drop in the unemployment rate. To see why the BEA is underestimating the strength of consumer data consumption, take a look at the chart below. 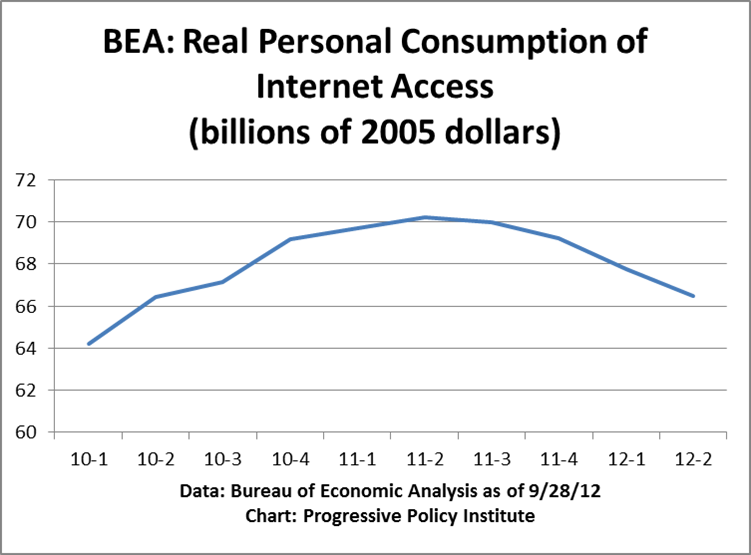 This chart, drawn directly from BEA data, tracks real consumer purchases of “Internet access”–both mobile and wired. Please note that according to these BEA figures, Americans are consuming less internet access in real terms than a year ago. That can’t be right. To put it a different way, the official GDP statistics are describing a world in which Americans are retreating from the Internet. That’s not the world we live in. Because this is “real” consumption, the effect of price changes is already taken out of the statistics. And as we explain in the paper, the “missing” internet access does not show up anywhere else. I found myself reacting to the Libor scandal more strongly than a lot of the earlier revelations of financial institutions misdeeds. First, the banks were just blatant out-and-out lying about a simple number. Second, their lying led to a distortion of a crucial piece of publicly available data–the Libor rate. In a market economy, intentional misrepresentation of a market price is not a victimless crime –in fact, the victims are everyone who relied on that price to make decisions. That includes regulators who presumably watched Libor as one of their guides to the amount of stress in the global banking system. Here’s a chart of Libor across the key period (downloaded from http://www.fedprimerate.com ). Would Libor have shown more signs of stress sooner if it wasn’t being manipulated in 2007 and 2008? And would banks, regulators, and investors reacted sooner? We’ll never know. But this confirms what I’ve written in the past–the financial crisis was in part a data crisis, where all sorts of numbers were sending misleading signals. In particular, the strength of the financial position of the banks was overstated. The question is whether the Libor scandal is a vestige of the past, or a sign of future troubles to come. My sense is that we’ll see a lot more opportunities for manipulation of private data to send misleading public signals. Forget about financial markets for the moment. I’m thinking now about the way that websites continually try to game Google’s search algorithms in order to get a higher ranking. Hotels and restaurants have a big incentive to try and manipulate their reviews on consumer sites such as Yelp. App developers have an incentive to game their reviews on the Apple and Google app stores. Will the bad information drive out the good? Or can we build information aggregation mechanisms that are more difficult to manipulate? Earlier this week the Conference Board reported that online help-wanted ads rose 232,000 in June, led by computer and math occupations. This positive note was buttressed by today’s ADP report of a projected 176K gain in jobs in June (see WSJ story), and a small drop in new unemployment claims. In many ways, the continuing boom in tech employment going to be the big story in the labor market for at least the rest of the year. Between mobile, apps, social media, and big data, the dizzying pace of innovation is creating demand for tech-savvy workers. This doesn’t necessarily mean coders, but it does mean some degree of familiarity and comfort with the new developments in tech. Right now the numbers are telling us that there are 5 want ads for every unemployed worker in computer and mathematical occupations. These want ads are all over the country, not just in the tech havens such as California and Washington. By contrast, the number of unemployed workers in business, financial and managerial occupations exceed the number of want ads by a considerable margin (roughly 1 million unemployed in business, financial and managerial occupations, compared to 750K want ads) (these figures come from the Conference Board press release). I’m going to be looking at tomorrow’s jobs report for signs that the tech job boom continues. The House Republicans appear to be conducting a war on economic data. They seem to think that defunding data collection is all gain and no loss. In fact, the anti-data Republicans are really anti-business and anti-growth. Government spending on economic data collection should be thought of as fully equivalent to investment in long-lasting infrastructure. When we build highways or airports, we expect them to be used by the private sector for economically-valuable activities. Highways facilitate the sale and use of automobiles, the construction of homes, the transportation of goods. Airports make air transportation possible, fostering all sorts of jobs and growth. Just like spending on highways and airports, government investment in economic data collection provides a long-lasting boost to private sector economic activity and to private sector growth. To give one very simple example: Political polling would be much more expensive and less accurate if the pollsters did not have access to government economic and demographic data. The government data enables the pollers to make sure their sample correctly represents the actual population. Another example: Many big investors take economic and demographic trends into account when deciding how to allocate their funds. The foundational data for these trends comes from the federal government. Less reliable data means more investing mistakes. Sometimes governments and politicians might rather hide data. The ACS tells businesses which areas of the country are doing well and which are falling behind, helping them make fewer errors in investment. This is not such good news for the weak areas, but presumably does improve economic efficiency. A company such as Walt Disney, for example, would rather locate its theme parks in growing, high-income areas (FYI Walt Disney World is located in the Florida district represented by Daniel Webster, who has been one of the main ACS bashers). Like highways and trucks, public sector data and private sector data are complementary, not substitutes. A company can invest in as many trucks as it wants, but those investments will be much more valuable if the government has put into place well-maintained highways. Similarly, private sector data collection and analysis–say, on the state of the computer industry–almost invariably builds on the foundation of the public data. One of the big economic advantages of the U.S. may be the quality of our economic data, and more generally the transparency of our economic system. That’s not a competitive edge we should cede easily. I was looking at the April CPI this morning, and I got to thinking about Dropbox. I use Dropbox literally 25-50 times a day. I’m working on a file on my Apple laptop, save it to the Dropbox folder, and I can be sure that the same file will show up on my PC when I get home. Dropbox costs me nothing for 2.5 GB worth of storage. More important, I’m getting a valuable service for nothing. Now comes along Google Drive, which supposedly functions much the same way, and offers 5 GB of storage. Now, I’m not going to switch any time soon because Dropbox is working fine for me. But a reasonable interpretation here is that the “price” of seamless online storage has fallen. But where does the fall in “price” of the Dropbox/Google Drive-type service show up in the Consumer Price Index? The answer: Nowhere. Free services such as Dropbox and Google Drive (or Facebook, or Yahoo Mail, or any other Web service without a price) do not affect the CPI, even as their usefulness increases. This is not a new observation at all (see for example the 2009 working paper “The Broadband Bonus: Account for Broadband Internet’s Impact on U.S. GDP” by Greenstein and McDevitt). Yet this omission of free online services from the CPI, once insignificant, has become increasingly important as we spend more and more of our time online. What has the bigger impact on Americans–an increase in the price of “lunchmeats” (2.3% over the past year) or a decline in the price of online storage (arguably down by as much as 50%, though it is probably less )? That’s a real question, incidentally, not a rhetorical one. We may have reached the point where Internet companies are providing free services that have a higher value than some things we pay for. How we change our economic statistics to reflect this new reality?